One of the most storied names in British naval history is being revived for the Royal Navy’s new class of ballistic nuclear missile submarines. The Royal Navy announced  last week that the first of its new submarines, initially dubbed the Successor-class, will be named HMS Dreadnought and the class will now be known as the Dreadnought-class. The Dreadnought name is one of the most famous  in the Royal Navy, having been bestowed upon nine ships dating all the way back to the 16th century. Ships with that name have fought in some of the world’s most famous naval battles, including the defeat of the Spanish Armada in 1588 and the Battle of Trafalgar in 1805. But without a doubt the best known Dreadnought is the steam turbine powered battleship commissioned in 1906  that changed naval warfare (and the world) forever. Significant progress is being made on the construction of two of China’s largest ever warships according to open source imagery obtained recently by Popular Science . Two hull sections of China’s enormous Type 055 cruiser —which will likely be around the same size as the newly commissioned USS Zumwalt —appear to have been completed. Meanwhile, China’s first indigenously-built aircraft carrier is even closer to completion, following the installation of its island tower  earlier this month. Last week Textron Airland announced  that it’s Scorpion Tactical twinjet had performed well in trials that successfully demonstrated its close air support capability. The twin-seat, twin-engine jet dropped air-to-surface missiles , including Hydra-70 unguided 2.75-inch rockets, the BAE Systems Advanced Precision Kill Weapons System and the AGM-114F Hellfire missile at White Sands Missile Range in New Mexico. Three years after it was launched as a private venture by the company, there are still no buyers in sight for the aircraft. But rumours  flying around suggest that the US Air Force plan to conduct an airworthiness assessment of the aircraft—a move that will hopefully boost its international appeal. China’s J-20 stealth fighter has made a ‘stealthy appearance’ , showing off its new camouflage paint job in the skies of Chengdo last week. Check out the photos here . There are some questions whether the aircraft—which is in the low-rate initial production phase—will be a match for the F-35 , though at the very least it will considerably erode the capability difference between existing Chinese aircraft and western advanced fourth generation types. The jets will reportedly  be combat ready by 2019. Remember the exploding drone saga  last week in Iraq? Well the Combating Terrorism Centre  has just released its report on Remotely Piloted Innovation . The report looks at the evolution of the use of drones by terrorists and confirms that Islamic State is the most prolific terrorist user of commercial drones, and is so far the only group to use a weaponised drone to kill. The US Army will expand a new vehicle mounted force tracking technology  to its combat platforms, including Strykers, Bradley and Abrams tanks. The so-called Joint Battle Command-Platform (or JBC-P) uses a high-speed satellite network to rapidly provide a digital map of the combat environment. The Australian Army also operates the Abrams tank, although it’s unclear if the new technology would be compatible with Australia’s tanks or Army’s C4ISR networks. 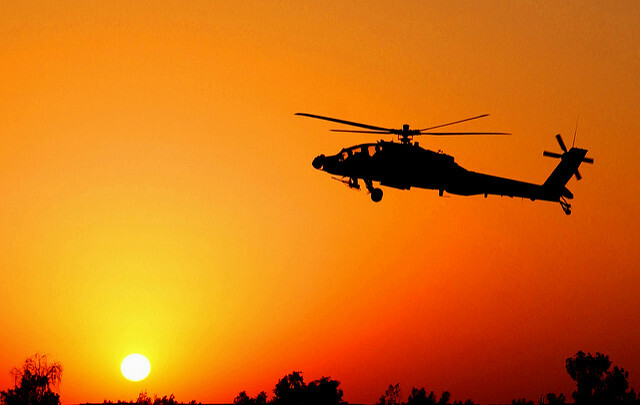 US Army AH-64 Apache helicopters are flying combat missions in Mosul, in support of Iraqi security forces. Apaches have been in Iraq since the summer of 2014 , mostly providing security for foreign dignitaries. Iraqi Prime Minister Haider al-Abadi had previously banned Apaches from campaigns in Anbar province, but US Major General Gary Volesky confirmed  last Wednesday that Apaches are now engaged in Mosul, flying and striking targets at night. ‘That platform has a lot of capability to see a long range at night and use its weapons system in a standoff capacity to strike targets, and that’s what they’re doing,’ Volesky explained. The Iraqi army continues its advance against Daesh in Mosul alongside a new player. Turkey’s military joined the battlefield  on Sunday following requests from Kurdish Pershmerga. But Iraq, which rejected Turkey’s offer for assistance, isn’t pleased . For analysis of the Iraq–Turkey stand-off, and Turkey’s interest in Mosul, see this video  by Al Jazeera. The Exomars Schiaparelli lander has been destroyed  landing on Mars. The European Space Agency confirmed that the lander ceased communication one minute before touchdown on 19 October. The ESA estimates that the lander dropped from the atmosphere at a height of 2.5–4km travelling over 300km per hour. New images  from NASA’s Mars Reconnaissance Orbiter have provisionally confirmed the lander’s fate. Data from the lander’s sensors is being analysed to determine the cause of the failure. DARPA has handed over control  of its 3.5m space surveillance telescope to the United States Air Force’s Space Command. The USAF will be responsible for dismantling the telescope at the White Sands Missile Range Mexico and moving it to the Harold E. Holt Naval Communication Station in Exmouth, Western Australia. The telescope’s finely tuned wide angle lens will be used to monitor asteroids, satellites and space debris. It’s expected to be reassembled in Australia by 2020. To improve the performance of the Jindalee Operational Radar Network, next year Australia will launch  two ‘cubesat’ micro satellites. The satellites, each weighing less than 5kg, were designed by a joint partnership between the Defence Sciences and Technology Group and UNSW. The satellites will form part of a small constellation of satellites designed to improve intelligence gathering for the Five-Eyes network. Defence Minister Marise Payne said  the missions would help deliver on the Defence White Paper’s promise to develop an indigenous space capability. Christopher Cowan, Thulasi Wigneswaran, Elisabeth Buchan, and Alexander Vipond are research interns at ASPI. Image courtesy of Flickr user Morning Calm Weekly Newspaper Installation Management Command, U.S. Army.